Working out of Walthamstow in N.E. 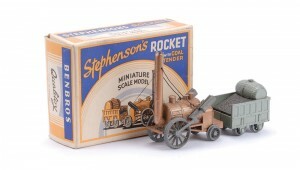 London Benbros was formed in 1940 by brothers Jack and Nathan Beneson manufacturing diecast metal toys and lead soldiers. Originally called Benson Bros. its not rocket science to work out how they arrived by 1951 at their adopted company name of Benbros. 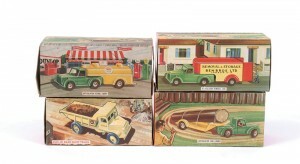 Around this time, the early 1950′s, Benbros somewhat limited range of vehicles was expanded with the addition of re-issues of several Timpo models for which they had aquired the dies following Timpo Toys decision to discontinue production of diecast vehicles. From the picture opposite of Benbros lorries its quite easy to see that the three articulated vehicles came out of the Timpo range. The articulated petrol tanker now with a SHELL logo and delivering to a Benbros garage, the articulated removals van, no longer Pickfords but in the livery of Benbros Removals and Storage and the articulated low loader. The Euclid Dumper Lorry was a copy of the Dinky #965. 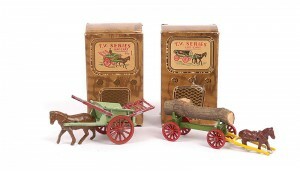 Late 1954 and Benbros introduced their ‘TV Series’ of small Matchbox sized models packaged in boxes resembling upright TV sets of the time. 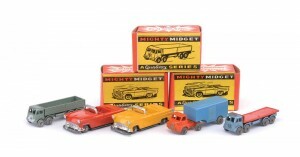 These models continued in this format for several years before the series was updated with a new name – ‘Mighty Midget’ – the packaging changed to a more modern red and yellow box with a line drawing of the model it contained, reflecting the style of the ‘Matchbox’ series, these small scale models having an average length of around the 2″/50mm. mark. The Mighty Midget series was available up to 1965. In an attempt to update their larger scale models in the 1960′s with a range which contained finer detail and more features such as detailed plastic interiors, plastic windows in some and jewelled headlights, Benbros brought out their ‘Zebra’ range of models. 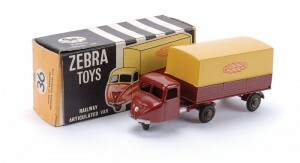 The Zebra range came packaged in a distinctive black and white striped boxes along with a coloured line illustration of the model it contained. Running alongside the Zebra range were other Benbros vehicles carrying the ‘Qualitoy’ name to the boxes. This blog is written by myself, David Rodgers. My personal area of expertise (such that it is) is in antique toys and games and I would like to think that by visiting this site now and again you will hopefully find it both informative and enjoyable, with some interesting articles, pictures and even some items for sale that may appeal ! Glamorgan Toy Products – Glam Toys – G.T.P. Dan Dare Pilot of the Future … yet still more toys ! British Toy Companies : Scamold – Scale Models Ltd.
Billy Bunter of Greyfriars School – Book Illustration Errors ? British Toy Companies : Burnett Toys – Burnett Ltd.
British Toy Companies : Gaiety Toys – Castle Art Products Ltd.
Japanese Toy Companies : DAIYA TOYS – TERAI TOYS Co.
rodgersantiques – open for business ! Custom Theme by DR. Valid XHTML 1.1 and CSS 3.